An eclectic Drupal theme, for outstanding brands. With a touch of eccentricity and grooviness. 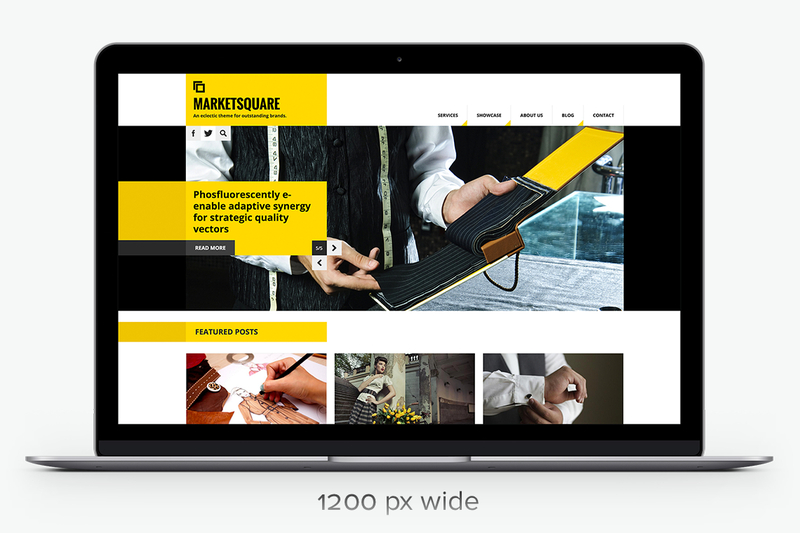 Monitors constantly get wider nowadays, which is why MARKETSQUARE gives you plenty of space for your content with an initial width of 1200px on desktop – and as much as needed on mobile. Enjoy the latest goodness in navigation on the web, by activating the "fixed position" for the header, with a single click through the theme settings. Add a touch of eccentricity to your site by expanding the design beyond the grid, with a single click through the theme settings. MarketSquare Pro & MarketSquare Enterprise come bundled with Drupal Commerce providing you a turnkey e-commerce solution right after installation. Easy, automated Drupal Commerce setup. Use the extra, built-in installation profile1 to setup your Drupal-powered e-commerce site with all the greatness Drupal Commerce brings along. Full integration with Commerce to manage payments1, with a range of different payment gateways, and a host of other e-commerce features. 1 Available only in the Pro and Enterprise Editions. MARKETSQUARE adjusts optimally to the width of the browser it is viewed on. As a result, it looks awesome regardless if it’s a desktop computer, smartphone or tablet your visitors are using. 8 awesome color schemes to choose from: Yellow, Cyan, Orange, Red, Green, Purple, Pink and Gray. Just pick the one that fits your brand with a single click through the theme-settings. Making it easy for your visitor to locate your business on the map plays an ever-growing role nowadays, and MARKETSQUARE does great in this direction. 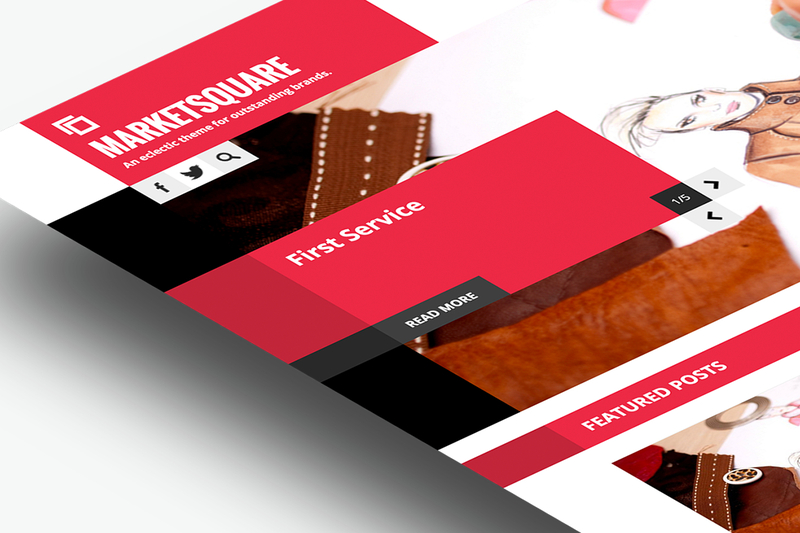 While it's great to use "as is", MARKETSQUARE has been built with flexibility in mind equipped with feature-rich, two-, three- and four-column responsive layouts for the showcase presentation. Show off your services, showcases and blog entries in all their glory. MARKETSQUARE comes equipped with a plugin which transforms the Main menu of your site into a dropdown select list when viewed from a mobile device. And you can configure the behavior of this plugin through the theme settings. MARKETSQUARE integrates with the Webform module and supports gorgeous forms – anywhere you want them. 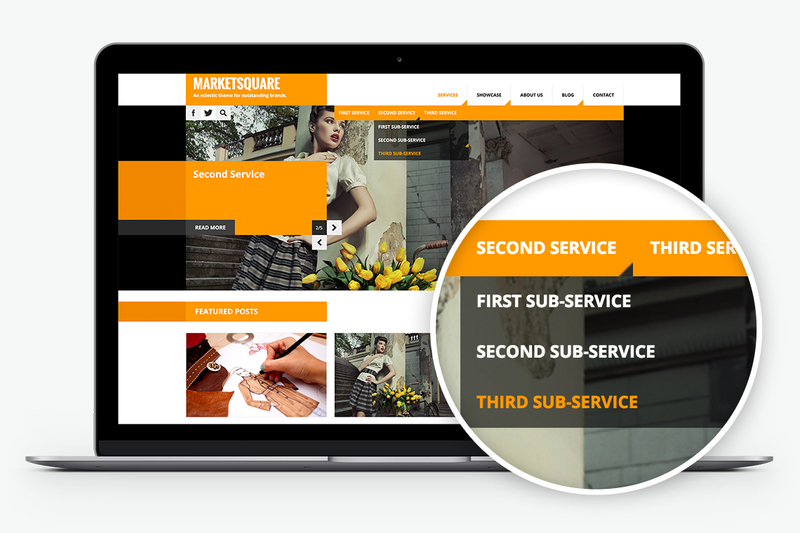 MARKETSQUARE integrates with the Superfish module supporting gorgeous multi-level drop-down menus with smooth motion. Included is the horizontal or vertical sub-menus, the relocating of sub-menus & hyperlink menu descriptions when they’d appear outside the browser window area. Select among tens of different font-stacks, with font-families for all tastes and corporate identities. Just pick the one that fits you with a couple of clicks from the theme settings. Comes with a wealth of custom regions: Header left, Header right, Navigation, Banner, Highlighted, Featured, Content, First sidebar, Footer left, Footer right, Footer bottom left, Footer bottom right, Subfooter left and Subfooter right. Yet it’s end-to-end compliant with the default Drupal regions. Enjoy attention to detail, provide your visitors those little goodies that make a difference such as a jQuery based “Scroll to Top”. With its built-in installation profile it’s easy to run a clean installation of Menu+ and have it up and running in a minute. Right after that, all you have to do is replace the "dummy" content with yours and your site is ready. Carefully crafted to comply with the best practices recommended for Search Engine Optimization (SEO). Thoroughly tested to ensure full compatibility with all major SEO-related Drupal modules and practices. All our themes come with built-in and preconfigured ImageCache module for automated image resizing. You just upload your photos and they are placed in the way they should be. Thoroughly tested to be fully compatible with all modern web browsers on both desktop and mobile. "Follow me" links are built-in into the design and functionality. But that’s the beginning; each theme comes with “deep” built-in integration with your social media accounts. We do our best to leave our code clear. We want you to easily read, understand and modify our code without pain. Thoroughly researched typography, with custom text styles for all HTML elements (text, list, form, tables) and support for Google fonts. More than just support. Help. We are experts in Drupal, love what we are doing and are serious about helping you. It's real help you will be getting, not cliché responses. A Drupal distribution with our premium theme and an installation profile, which makes it easy to run a clean installation that looks just like our live demo (without the demo images). Right after, all you have to do is replace the "dummy" content with yours. A simple Drupal theme, which you can install on top of any Drupal site. Each theme comes with high quality documentation but that’s just part of what’s there. As a theme license owner, you get Full Access to our Support Center with continuously updated content based on the most Frequently Asked Questions. Need help selecting this or any theme? Aren't sure whether it matches your needs? Here’s the various ways to get help, find out more or contact us. The ultimate Drupal toolset for agencies and freelancers. Drupal 7.x theme with Views. Priority Support: guaranteed responses within 24 hours after every request. Premium support for one month incl. guaranteed responses within 24 hours. Your most requested customizations, now optionally bundled with our themes. Choose what you like. Notice: Our themes enable you to easily upload your logo and have it rendered in the space designated by the theme. Based on (a) the dimensions and aspect ratio of your logo, as well as (b) your site-name, and (c) slogan/tagline, styling edits to the theme may be needed, to make everything look optimal—as if the theme was designed for those specifically. After your purchase, our team does styling edits to the theme so that the logo you will provide, the site-name and slogan are rendered in an optimal manner—as if the theme was designed specifically for those. This service does not include designing or editing your logo. Υour logo should be ready-to-use by the time you provide it to our team. Notice: Our themes come in multiple built-in color schemes so you can choose the one you prefer. They also support editing any of the color schemes according to your liking, via CSS. If none of the built-in color schemes matches exactly your corporate colors and you don’t have the time or experience to do the re-coloring yourself, then our team will re-color the theme using your corporate colors for you. Our team asks you for the colors or elements of your marketing material (e.g. : business card, brochure, logo, etc.). Our team shows you the theme recolored with your colors, in the form of screen shots, for your review. Once approved, our team incorporates your custom-tailored color scheme into the theme, in a way that everything is preserved in case of future updates to the theme code. this service does not include exploring the creation of a color scheme for your site. It is assumed that you already have marketing material or preferences, that will be used as the basis. Notice: Our themes enable you to easily select among a number of fonts of all styles (serif, sans-serif, slab serif) easily, through the theme settings. Fine tuning the theme so that it uses your corporate font, a premium subscription to a font service, or typographic guidelines that you would like to incorporate into the theme, for consistency with the rest of your marketing material. Our team asks you for your typographic preferences or guidelines and fine-tunes the theme according to those. Fonts may be provided either from free repositories or from commercial, subscription-based services. The code to activate them on your site is usually provided ready-to-use by the repository or service that hosts your web fonts. If needed, our team can assist you to find it. This service refers to integration with Mailchimp, a sophisticated mass-email service and solution for easy management of subscribers, submission of newsletters, monitoring/reporting of subscribers’ response/behavior to newsletters etc. Creation of the necessary email list on both sides; Drupal and Mailchimp. Configuration of the subscription form on your Drupal site so that it automatically subscribes new users to the Mailchimp list. Which of the buying options above allow me to use a theme in multiple domains? Pro, Enterprise and our Get All Themes bundle of all themes allow you to use themes in multiple domains. Difference between Commerce-ready and bundled with an installation Profile with Drupal Commerce? Drupal Commerce-ready means that the theme is coded and thoroughly tested to be compatible with Drupal Commerce, e.g. : all the necessary CSS classes are included. Bundled with an installation Profile with Drupal Commerce means that along with installing the theme using our Installation profile, you can also install using the extra profile the built-in Drupal Commerce so that it works out of the box. Can I remove footer credits and social media links or change those with mine or my client’s? Absolutely. These are there only as a way of showcasing how you can make use of those under real-life circumstances. Go ahead and remove them or change them to your own or your client’s. Say I have decided to get all themes for one year. What happens when my subscription expires? Will I be able to keep using the themes? When your subscription expires you will be provided with a discount for renewing it within the the first 30 days. If you don’t wish to renew it, you will still be able to use all the themes you have already downloaded without limitations. However, you won’t be able to access new themes, or updates to your existing themes. What’s included in the installation service, if I get the Enterprise version? Refers to one (1) clean installation on your server, using our installation profile. This installation takes place within 24 hours after purchase, on work days. In case of purchase during the weekend, installation takes place within 24 hours of the first work day after the weekend. Say I have decided to get all themes for one year. How long will I receive theme updates and support for? You will receive updates and support for one year from the day your Membership starts. What is the difference between Basic Support, Priority Support and Premium Support? All requests, for either Basic, Priority or Premium Support are handled with the same devotion. The difference among them lies in the speed of responses, and the kind of assistance each model provides. Priority Support (included in the Pro edition), is guaranteed to provide you high priority responses within 24 hours after every request. Premium Support and includes top priority support responses via email, exclusive Live Support, as well as Remote Connection to your server or computer to help out, if the need occurs. What do I get with each theme, as part of my MtT Club Membership? You get for each theme the exact same wealth of resources, that the Pro Edition of the theme includes. Feel welcome to check out what’s included in the Pro Edition of some of our themes, as reference. How do I get access to the theme files, whenever I need to? As an MtT Club Member you will get your own account and private space in the MtT Portal. By logging in in the Portal, you can get access to all themes available at the time of your Membership, including latest updates and previous editions of those. All contributed by real-life people. Just completed my new Showcase+ Drupal 8 web site. It's a super impressive theme with very intuitive customisation features. Thanks – that has done it. This is why I love you guys so much! Great! Thanks for this quick answer. 5 star service! That’s fantastic. looks fantastic. You’re hired :-) Corporate Plus is a masterpiece of design. Layers upon layers..
I’ve bought many themes before, most are junk. I’ve gotta say, this theme is very well built. Kudo’s to the developers who put in the extra effort. Thank you very much for your help. You really are 'The Experts'. Do they know something you don’t? Sign up to our newsletter or follow us on social media. some of the best premium Drupal Themes around. Some awesome freebies too. developers, designers but most of all, Drupal geeks. Copyright © 2010-2018 MorethanThemes.com. All rights reserved.